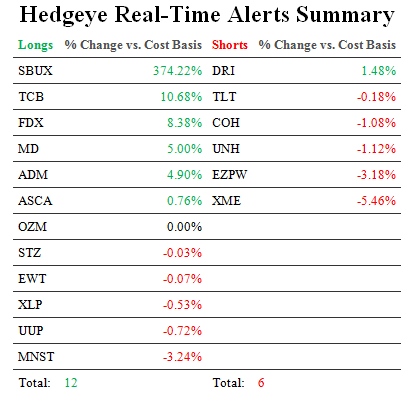 This note was originally published at 8am on January 10, 2013 for Hedgeye subscribers. "He who ate the chick must also eat the rooster, or pay for it." Dom Francisco de Almeida (1450-1510) was a distinguished Portuguese solider and explorer. Also of noble background as a counselor to King John II of Portugal, he is widely credited with establishing Portuguese hegemony in the India Ocean – paving the way for nearly a century of Portuguese dominance in the Indian Ocean trade. Before Almeida’s arrival as commander of Portugal’s fourth seaborne voyage to India, the Portuguese Empire had been struggling mightily to establish a stronghold in this globally omnipotent trading hub, failing to cultivate key trading relationships in addition to being denied a meaningful presence at key ports. The first voyage was commanded by Vasco da Gama (1460-1524), who is credited with captaining the first ships to ever sail directly from Europe to India (1498), rounding the Cape of Good Hope into what was previously believed to be a landlocked Indian Ocean. Beyond his discovery – which is arguably the most important geographic discovery in the history of globalization – his first voyage was a broad failure, losing roughly half his men and two of his four ships. The second voyage of eight ships was commanded by Alvarez Cabral, which set sail for India’s port cities in 1500. After an inadvertent detour to the coast of Brazil, Cabral and his depleted crew finally docked in Calicut six months later. Cabral’s brief stay in the region was highlighted by two violent skirmishes with established parties within the region, which perpetuated more largely unsuccessful trading exploits. He hastily retreated to Lisbon with just five men and one ship. The third voyage was once again commanded by Vasco da Gama. Setting sail in 1502 with a 15-vessel fleet, da Gama’s primary objective was to uproot the Egyptian power preventing Portugal’s establishment of trading dominance in the region. To some degree, da Gama found a fair amount of “success” – particularly in combat. His fleet is credited with burning alive 250 men, women and children on a ship, as well as slaughtering 800 fishermen in Calicut. Shortly after his ruthless exploits, he traveled to neighboring Cochin where he defied local wishes and set up a well-forfeited trading factory. A costly tactical error would have cost the Portuguese all of their progress in India when Cochin was overran by Calicut forces, had it not been for the timely arrival of our “hero” Francisco de Almeida. Under several years of the viceroy’s leadership, Portugal was able to make solid headway into Indian Ocean trade. His eventual victory over a joint fleet of Gujarat, Egyptian, Calicut, Ottoman, Venetian, and Ragusa forces in the Battle of Diu (1509) cemented Portugal’s dominance within the region and ultimately allowed the empire’s trading and transport strategies to flourish. It is believed that had Almeida’s son Lourenco de Almeida not been murdered by a joint Gujarat-Egyptian fleet in the First Battle of Chaul, the decisive Portuguese victory mere months later at the Battle of Diu would have eluded the history books. The battle itself was pursued as a personal outlet for Almeida to avenge the death of his son, which is the origin of the highlighted quote above. Motivated by the pain of a lost child, Almeida’s hasty foray into battle helped the Portuguese Empire finally overcome the headwinds to Portuguese dominance of the world’s most important trading route at the time. If this colorful story of persistent failures preceding ultimate triumph reminds us of anything, it’s modern-day Japan. Plagued by persistent deflation (10YR average annual CPI = -0.2%) and nonexistent growth (10YR average annual nominal GDP growth = -0.7%), the Japanese economy has long been failing to establish itself as anything remotely resembling vibrant, dynamic or just plain healthy. If Japan is the modern-day version of the Portuguese Empire – oft seeking, but not finding – then Japanese policymakers have undoubtedly been reincarnated versions of Vasco da Gama and Alvarez Cabral, multiplied many times over. For over ten years now, Japanese policymakers have implemented a variety of “counter-structural” strategies (i.e. there’s absolutely nothing cyclical about Japan’s economic malaise) designed to overcome deflation and perpetuate nominal GDP growth: perpetual ZIRP, quantitative easing, comprehensive monetary easing, bloated sovereign deficits, etc. All have failed to deliver the Japanese economy the inflation and nominal growth it has so desperately sought. Enter recently-elected prime minster Shinzo Abe, who we think has a chance to be Japan’s modern-day version of Francisco de Almeida. Abe, head of the ruling Liberal Democratic Party (LDP), can indeed be said to be motivated by the “blood of a son”. The LDP has long been the dominant political party in Japan. With the exception of a brief 11-month period between 1993 and 1994, the LDP was in power from 1995 through 2009, when it was flat-out dominated by rival Democratic Party of Japan (DPJ) in the AUG ’09 general election (308 to 119 seats). On the strength of party leader Shinzo Abe’s pledge to proactively pursue a nominal growth target of +3% and an inflation target of +2%, the LDP was able to take back control of the Lower House to the tune of 294 seats vs. only 57 for the DPJ in the DEC ’12 general election. Focused intently on the previous failures of Japanese policymakers (particularly the central bank) to deliver the goods, Abe has adopted a very open and aggressive anti-deflation stance in the media. 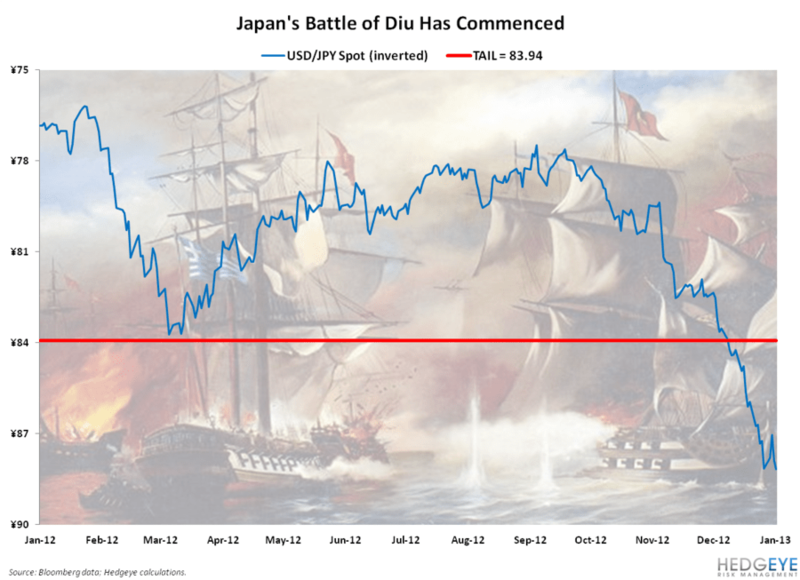 His appointment of Taro Aso as Finance Minster is yet another signal that he is prepared to do what it takes to win Japan’s version of the Battle of Diu. Experimental monetary POLICY – particularly a foreign asset purchase program (likely several weeks after the previous catalyst materializes). All told, we are of the view that a true phase change in the Japanese economy is definitely underway. While some may still be viewing Abe through the same lens as previous Japanese policymakers, we think it will continue to pay to be short the Japanese yen with respect to the intermediate-term TREND and long-term TAIL. And while we continue to view incremental monetary Policies To Inflate and expansionary fiscal POLICY as reflationary for Japanese equities and supportive of regional sentiment in the near term, we continue to flag material risk of Japanese currency and sovereign debt crises borne out of those same policies with respect to the long-term TAIL. Our immediate-term Risk Ranges for Gold, Oil (Brent), US Dollar, EUR/USD, UST 10yr Yield, VIX, and the SP500 are now $1642-1671, $110.28-112.82, $80.26-80.81, $1.29-1.31, 1.84-1.96%, 13.34-16.03, and 1446-1491, respectively.